A couple of clips for holding paper tight when binding. 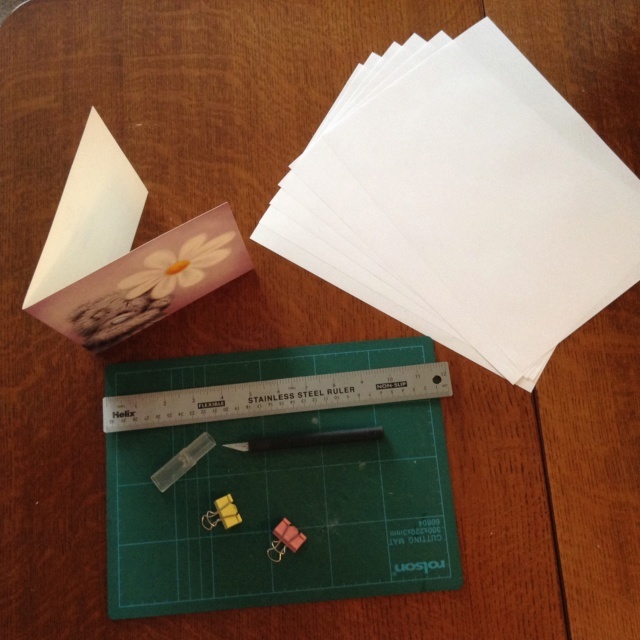 You will also need either a pair of scissors, a sharp knife or a paper cutter to cut the card and paper to size. 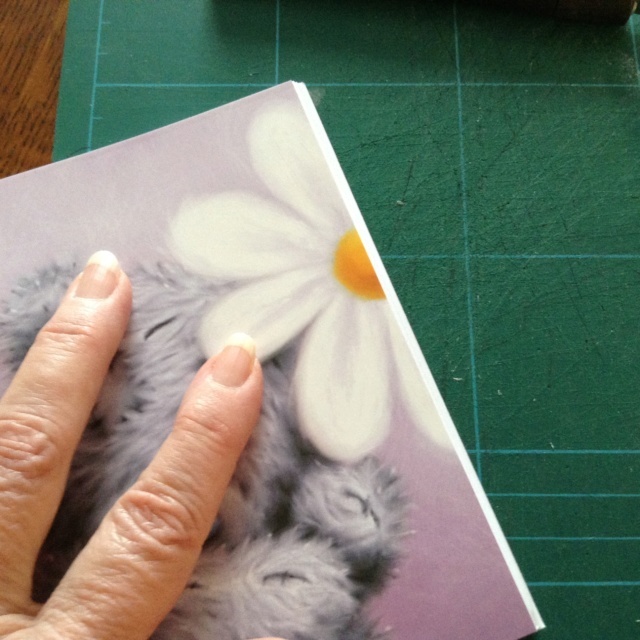 1) Cut the birthday card down to measure A5 size (148 x 210) when opened. 2) Cut the A4 paper in half to create 12 sheets of A5. 3) Fold the 12 x A5 sheets in half. 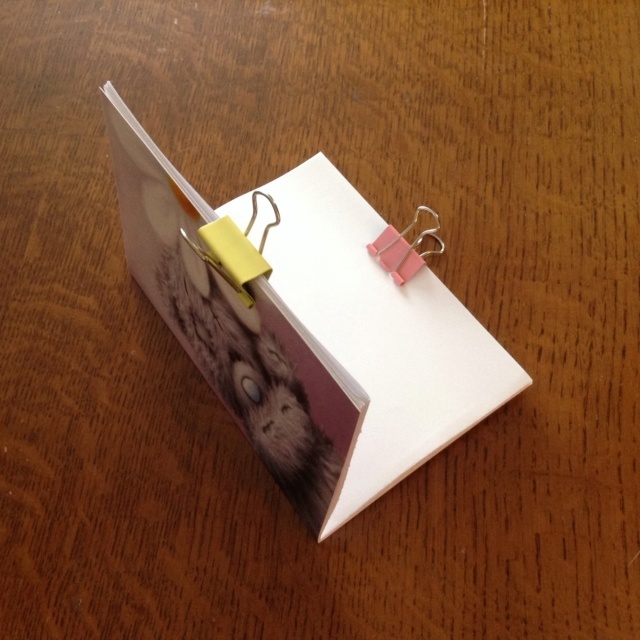 Clip them together firmly to form the booklet. 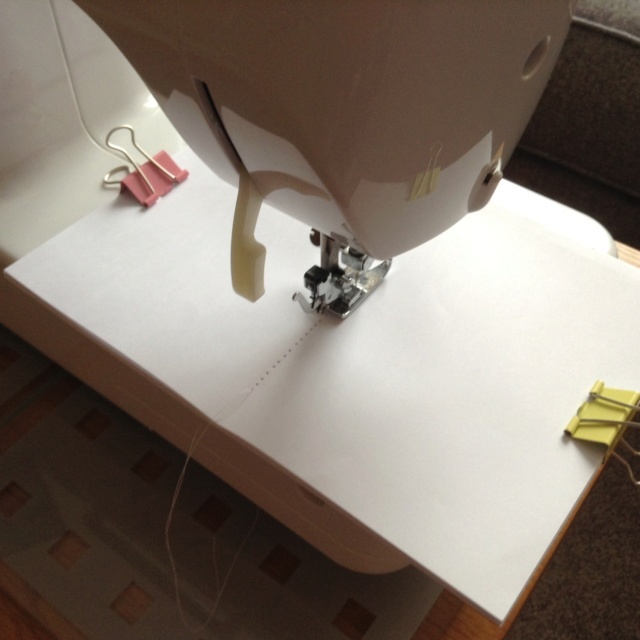 If using a sewing machine adjust the stitch length to the longest your machine has. Because the booklet is very thick to go through the machine you must not use the treadle but instead manually turn the machine wheel around and allow it gently, with each stitch,to push the needle through each layer of paper. (You may find it safer not to actually plug your machine in incase you accidently use the treadle). You do not need to sew the whole length. You can start sewing an inch or so from the top and finish an inch or so from the bottom. To tie off use a needle or pin to pull the thread from the front of the book to the inside and then tie the two threads together top and bottom. If sewing by hand you will find it a lot easier to make some holes, half inch apart, evenly spaced down the centre first. 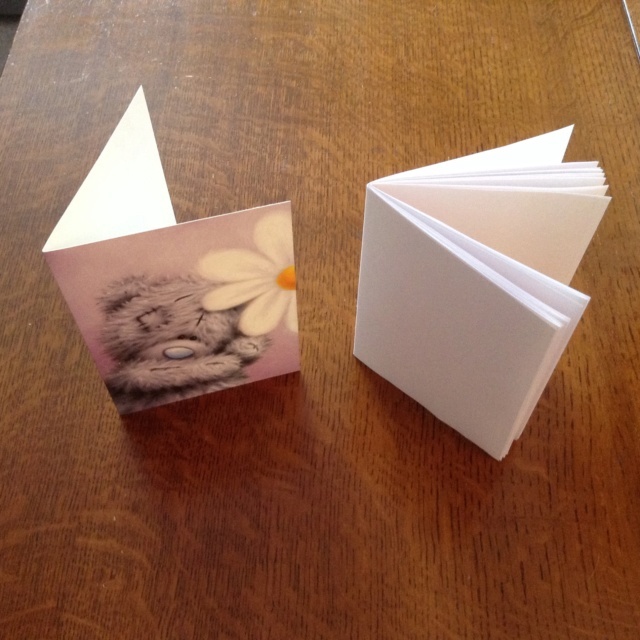 Once sewn together you will notice that the notepaper is longer at the opening than the card cover. Using the metal ruler and craft knife trim this excess off. You will then have one beautifully completed little notebook. I started making the odd one or two of these last year by actually going out and buying card for the front covers. It wasn't until yesterday when Margaret had asked me to make one for her to have hanging around her neck, as I do mine now, that I suddenly thought of all the birthday cards I have in the drawer that I bought in bulk from the charity shops ages ago that I could have fun using. I think I might actually make these into real birthday cards instead of giving an ordinary birthday card. They certainly would make a different sort of birthday card I think. Many cards come blank inside anyway for personal words. This is a great idea and something to do in winter time. You could even create the nice front page by printing out a photo or picture of your liking on thicker paper. Yup. There's no end to how one could personalise one for people. I might make some for Christmas cards this year by using images from the web. They're great but I wouldn't have the patience these days. Especially to sew them by hand. The very first ones I made I sewed by hand. I used dental floss as it's strong and only did 3 large stitches in the centre of the spine. I did like it that way better than machine stiching but it was hard to make the holes through that amount of paper. If I was going to make a lot then it would have been worth me buying a special punch that you can get that you use by hitting the punch with a hammer. The punches are only cheap but I couldn't at the time get to the hobbie shop a few miles away to buy one. Either that or if one has one of those really long staplers then one can staple the spine. at a church sale last summer. They would love this idea. When we (my sisters and I) were very young, my Mother always encouraged us to make gifts for our Aunts and Uncles for Christmas. I remember one of the things we made were wallets to hold a writing pad one side and envelopes the other. They were made from coloured card folded over each side and we would sew them up with wool thread to match or contrast. We used to love doing that sort of thing with Mum. 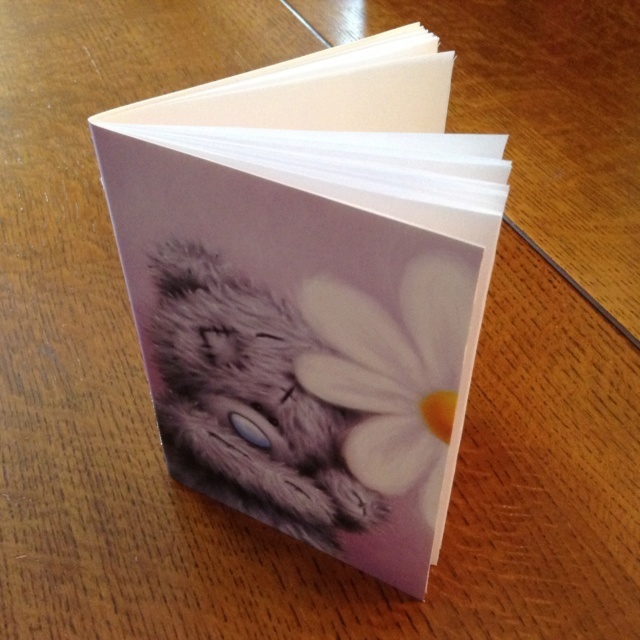 I hope your Grandchildren have fun making these little note books.